Because I have observed this is one of the few phases students struggle with in their academic journey, with a burning passion in my heart to see more students excel in this regard I have decided to share relevant tips to an excellent research as well as provide constructive advice where necessary. It is important to state here that I do not claim to know it all but I can be part of your success story. Also, all I will be sharing will be from my perspective as a student. Let me start this way, I didn’t start my academic journey as a ‘Nerd’. I didn’t have all A’s in my JSSCE OR WAEC. Infact, I had more C’s in my WAEC result but glory to God ‘we have the mind of Christ’ and that face is past now. My name is Wunmi Kayode. A 2013/2014 postgraduate of University of Leeds, Accounting & Finance. I did my undergraduate at Covenant University, studied Accounting, finished in 2011 (Beacon Set). I have been able to pass all ICAN (Institute of Chartered Accountants of Nigeria) modules which makes me an Associate Chartered Accountant (yet to do induction tho’). My passion for research started growing when I was opportuned to present a paper on ‘Adoption of IFRS in Nigeria’ with two of my Lecturers as an Undergraduate. Because of my interest in IFRS adoption at this time, I made it an area to explore for my Undergraduate Project. All these happened 2010/2011. September 2013 I came for Masters in UK, fast-forward to 2014 I choose the dissertation route, wrote my project proposal, I had the highest score (Thank God). Finally wrote the dissertation I had 75% where the highest score was 80%. This boosted my average so much so I made a Distinction. Has it been a smooth sail? No!!! 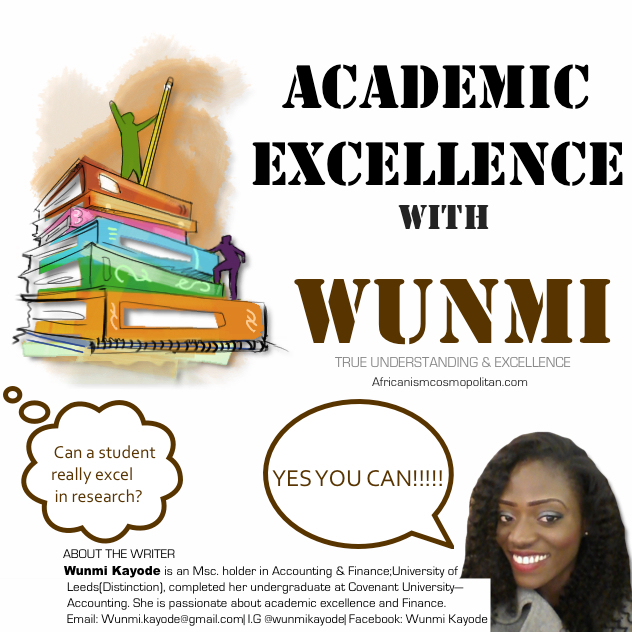 Can you as a student excel in research? YES!!!! Until I come your way again,Stay Winning! This is rejuvenating. I have always been interested in research but here in Nigeria, it seems opportunity for such is pretty low. @villebilingue you’re right! However I think if more people(like you and I) come out of obscurity, we can make research a platform that births solutions to the nation even to the globe.